I went into a Woolworths store today. That was something I never expected to do. I thought Woolworths was dead and gone. Apparently not. 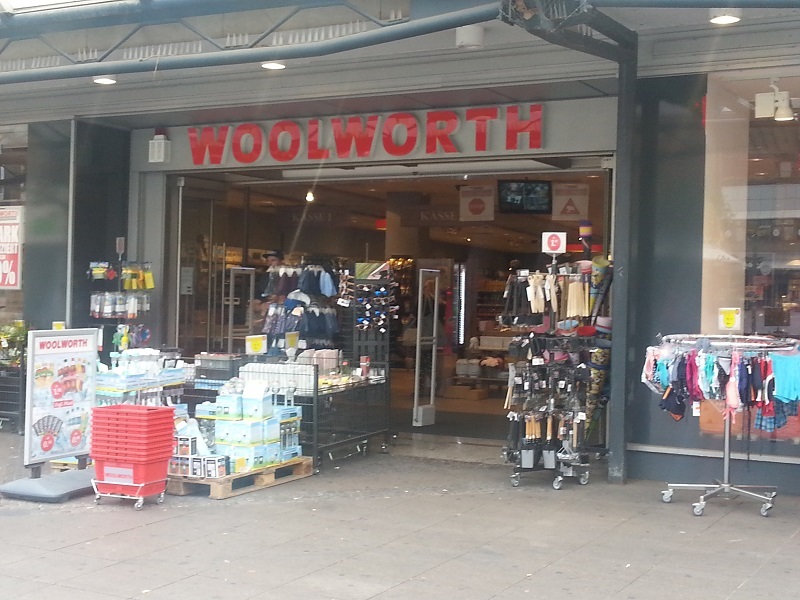 Although the UK chain went bankrupt and shut up shop a number of years ago, The Woolworths stores in Germany are still going strong, albeit without the “S” at the end of the name. In Germany it’s Woolworth, not Woolworths. When I was a kid my parents sometimes used to take me to the Woolworths in Northallerton. I bought my first fishing rod there. It was one of the stores’ own-brand products and, if I remember correctly, it was part of a Woolworths Course Fishing Starter Kit. I bought my first single (45 rpm) at the Woolworths store in Aberdeen. The year was 1984 and the single was What’s Love Got to Do with It by Tina Turner. I bought a lot of other stuff at the stores as well and used to like the Pick ‘n’ Mix sweets. Woolworths was a name I grew up with. All the big towns in the UK had a branch of “Woolies”. The idea that the stores may vanish from the high streets never crossed my mind. The company had been around so long it seemed bullet-proof. BANG! In 2008, the unthinkable happened. Woolworths stores began closing all over the UK. Then in January 2009, the parent company in the USA (Woolworths Group) went into administration and Woolworths was dead. At least that’s what I thought. When I arrived in Duisburg a few weeks ago, I began walking around and saw a Woolworth in a street near my present home. A few days later I saw another Woolies in the city centre. How could this be? It was time for me to go online and, as is normally the case, Google had the answer. In 1927, the American company F. W. Woolworth Company founded F. W. Woolworth Co. GmbH and began trading in Germany. By this time the company had been active in the UK for 18 years, trading as F W Woolworth & Co, Ltd. The German subsidiary broke free from the main company in 1998 via a management buyout. However, it had a few problems in the coming years and, for a while, things were a bit touch and go. In 2009, a few months after the original Woolworths empire crumbled and fell, the German chain was struggling to compete with the low prices being offered by discount stores and specialist retailers. The board of directors voted to declare insolvency and Woolworth stores began closing in Germany. All that changed in 2010. The Tengelmann Group bought the company, turned things around, and started opening stores instead of closing them. Things are looking up for Woolies and Tengelmann has acquired brand rights for a European expansion. However, the UK is excluded, so it seems Woolworths won’t be returning to UK high streets any time soon. Is a Woolworths in Bridgetown, Barbados too…. I didn’t know there were any Woolworth stores in Barbados, so this is an eye-opener for me. There are stores in a few countries though, including Mexico. As far as I know all of them remain for the same reason the Woolworth stores in Germany still exist—management buyouts.